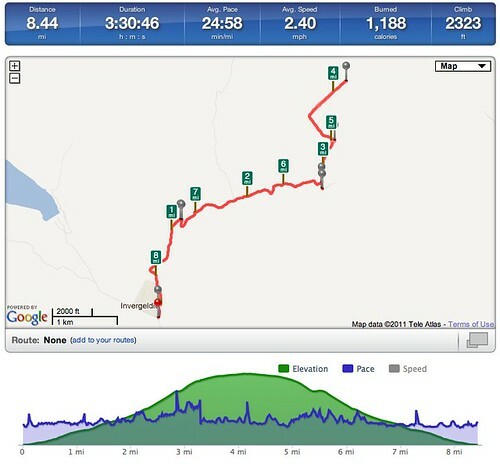 Scary – it’s almost 2 years since my last hill walk which was a return to Dumgoyne. We wanted to tackle a munro but time and weather meant a more sensible first walk of the year – Drymen to Balmaha via Conic hill and back again. Unlike the previous weekend, the weather had closed in and there was a cool breeze and a bit of drizzle on the way up Conic. I didn’t bother taking any photo’s from the top of Conic as I’ve been up there a couple of times now and the winter set from 2011 on Flickr contains some far better photo’s. It was also windy with not much of a view. 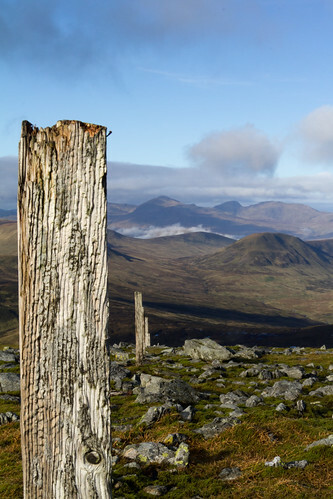 Speaking of views, there’s been quite a bit of deforestation on the route from Drymen which really opened up the route to more impressive views. We chose to walk along the road back to Drymen rather than following our footsteps but to be honest there isn’t much to see from the road apart that Conic looked far better as the day cleared up for a few hours. Timing is everything. 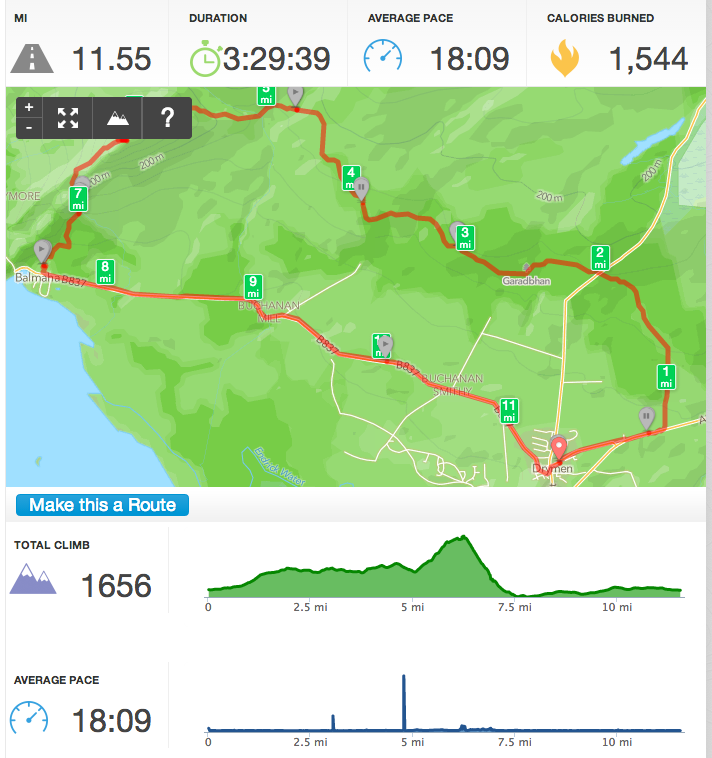 RunKeeper stats for the walk are below. 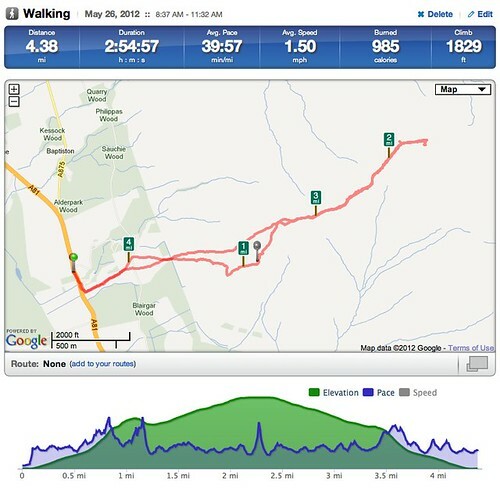 Overall a good walk that got the legs going and hopefully isn’t the last one for another couple of years. 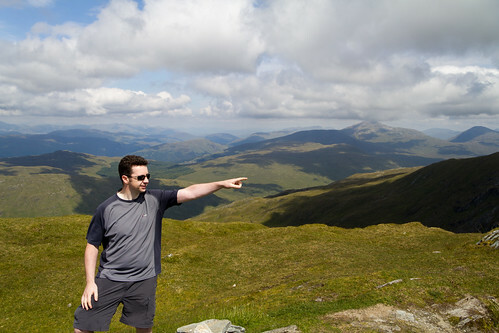 Maybe a munro next? With the weather finally taking a turn for the better it was time to get the walking books back on. 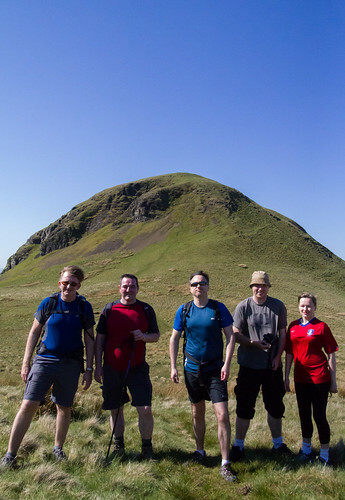 I’ve not walked since November much like my walking buddies so we decided to start small and picked Dumgoyne as its close by, not too tough and the views are great. 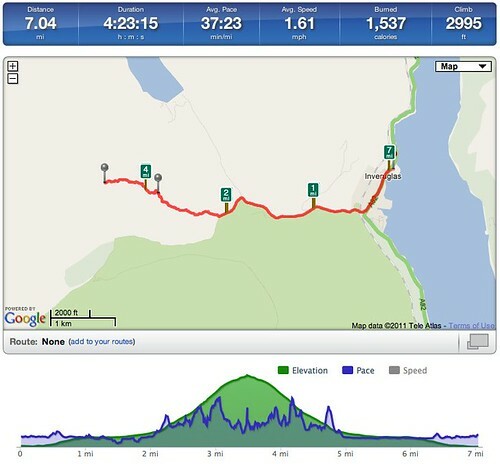 I walked up Dumgoyne at the start of 2009 and I found it pretty tough needing lots of stops. However today felt like a hard stroll and I was surprised how quickly we got to the top. We carried on to what we thought was Earls Seat but we were one summit short of that one. So a great day especially with the weather. Not so great was me totally fluffing most of my photos on the walk as my settings were for indoors and not the clear blue skies we had today. When will I learn! Full set of the photos that did turn out (auto FTW!) are up on Flickr. It’s been over three months since my last hill walk, due to a variety of reasons mostly involving the pish weather we’ve been having recently. So I was sitting with Danny on Friday moaning about our lack of walks and mentioned it was to be nice this weekend. We both had some muscle pains though. 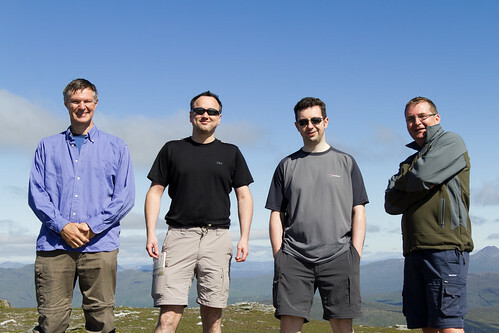 A quick Google search for the easiest munro turned up Ben Chonzie – 12 hours later and I’d ticked off another munro. Result! 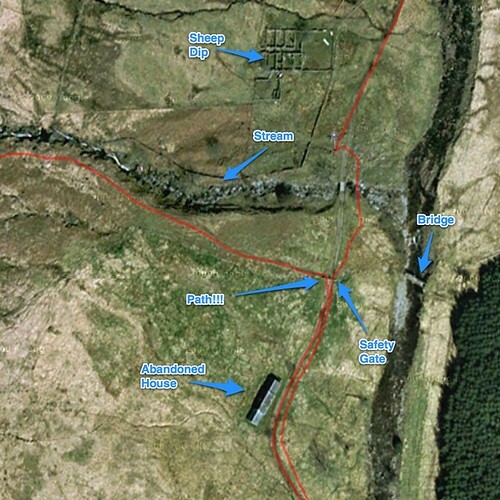 Ben Chonzie is easy for a few reasons. Firstly, you start from around 200m unlike the many that start form sea level. Secondly for 2/4 of the route you follow a land rover track which isn’t too steep. 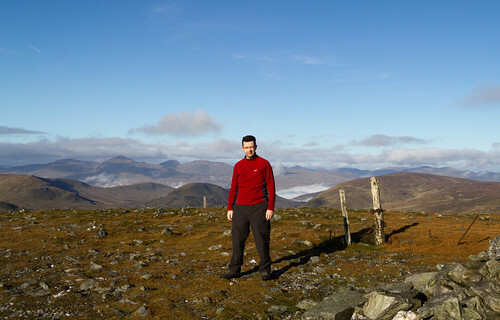 Once you come of the track and get near the summit there is a fence post that you can follow to take you to the summit. Overall it’s an undemanding walk but we struck it lucky with the weather and it was a great day considering the cold start. Great views all around but sitting at the top for some lunch was pretty chilly and I was glad of the hat and gloves. 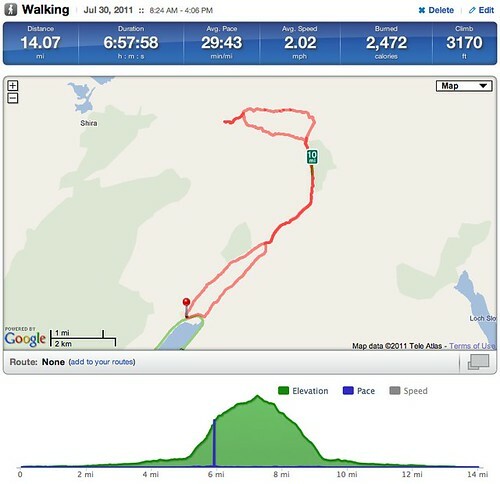 If someone is keen to try walking, pretty fit and wants to do a munro then Ben Chonzie is a good choice, but with the warning that this is a lot easier than other munro’s that I’ve done. It’s also a good winter hill as the fence posts at the top and wide track on the way up help with navigation in the snow. The full set of pics (not many) is available on Flickr. One final thing. Me and Danny can easily talk all day about a variety of different topics, funnily enough we always agree that we’re experts in these topics 🙂 One that we stumbled on was McEwan’s Lager and this advert. Enjoy. A couple of months since the last walk but the weather was too good to ignore. 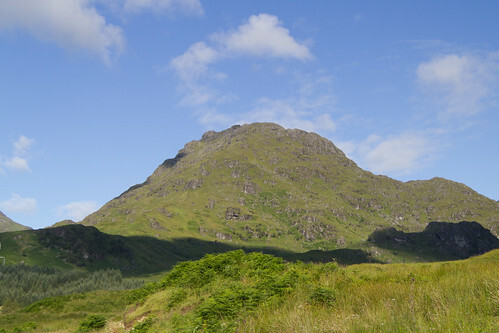 This time it was to tackle Ben Vane, another one of the local munro’s. Setting off early on a glorious day we were surprised how quiet it was for a mid summers day. 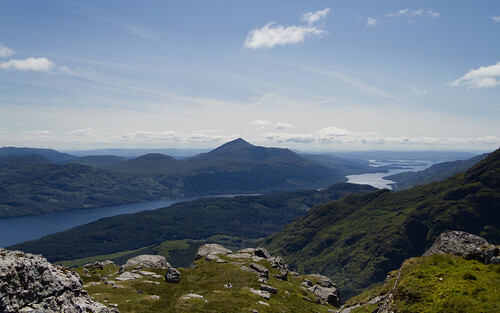 We were quickly rewarded with some great views back over Loch Lomond. It then turned quite boggy – wish I’d worn my gators as the boots were caked in mud on the way up and down. The boggy ground only lasted for 15-20 mins though and the rest of the way was on ok but steep paths. There’s plenty of false summits and also some scrambling near the top but it was worth it. For a summers day when temperatures at ground level were nearly 20C, it was a wee bit chilly at the top with temps nearer 5 or 6C. Still, it was nice to cool off, grab lunch and take in the views which were stunning. Usually in summer you get a lot more haze but not today. A very helpful fellow walker took the above photo. More telling is that while the camera was in her hands it seemed to perform so much better. I need to spend time revisiting many of the 550D’s features! Considering the stops and the 30 mins for lunch we made really good time on Saturday. Even on the way back down I was surprised by the lack of fellow walkers. Also surprising is the impact on my thighs this week – it’s 5 days since the walk and they are still a bit tender. I must look into improving strength/recovery as it seems to impact me more than others. As usual, all photo’s can be found on Flickr and also Facebook and Google+. Trying other ways of getting photo’s out to friends as not everyone likes or uses Flickr. 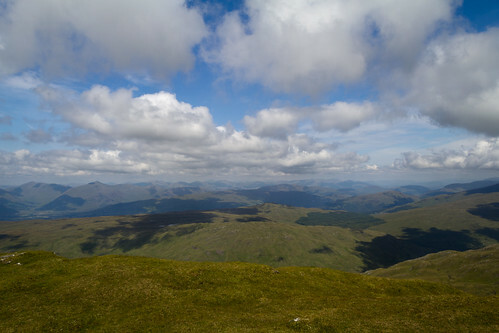 So that’s five out of the six munro’s that make up the Arrochar Alps ticked off, leaving just Beinn Bhuidhe which will hopefully be this weekend as the weather is looking good if not a tad hotter. Early start required.